Mini Bottle of Merlot 187ml MLP - a premium red wine to savour and enjoy. Mini Bottle of Sauvignon Blanc 187ml MLP - a premium bottle of white wine. Simple instructions with this one, twist off the top, pour in to a glass, take a seat and relax! Gnaw Mint Choc Chip Bar 110g - a sensational slab of chocolate from those wonderful people in Gnawfolk! Moreish mint with Belgian dark chocolate chips - perfect to gnaw at any time! Presented in a funky Red Gift Bag and topped with lime green tissue. All ready to hand over if you're giving this one in person. 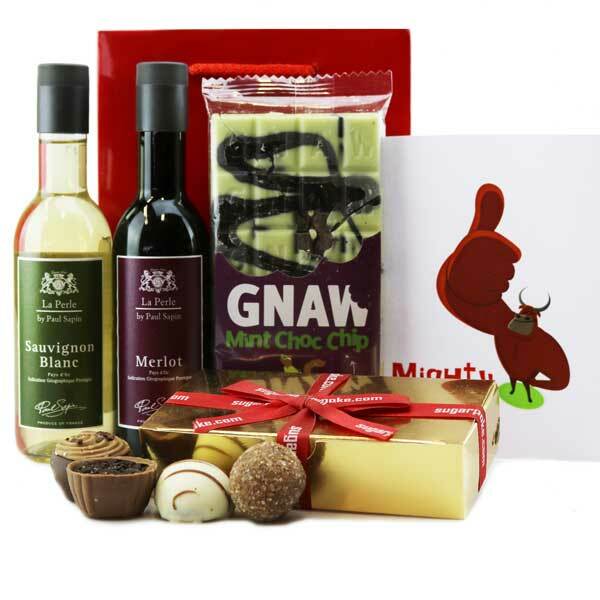 Great to send a couple to share, or even someone you fancy on valentines day! A great idea to wish 'good luck in your new home' too.